To wrap up my first clay experience, my beginning wheelthrowing class was a lot of fun.I made more pieces than I had expected – a few of them actually gift-worthy – and found several inspiring and beautiful glazes. I've gotten almost all of my clay pieces back from the kiln. Some of my pieces turned out better than others, but overall I’m really pleased with the variety. I offered to pick up a weekend shift at work last Sunday in exchange for having a weekday off – and not just any weekday, but the same day that my good friend, Becky, had off.You may ask, what did we do with our glorious and rare day off?We hiked, of course! After a pre-dawn drive up to the mountain in my Chevy Silverado, thermoses of hot coffee in hand, we arrived at the ski basin parking lot to begin our Triple Peaks hike.The morning was chilly (or “brisk” as we would say in the north country) and reminded me of early mornings in northern Minnesota. 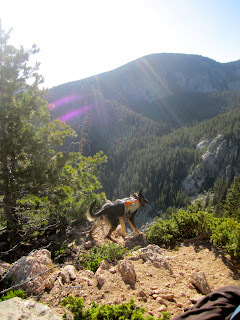 The Circle Trail has a few steep uphill sections, but overall is a short and easy hike that offers beautiful views of the Santa Fe Ski Basin to the northeast, the Sandias down south near Albuquerque, and the Jemez mountains to the west.